This song is my testimony of salvation. The turning point in my life came when God got me to a place where I had to be still. My husband, Brian, and I had recently come through a failed business that led to our bankruptcy and then a move to the nearest city in search of a job. We couldn’t afford to do anything but sit at home! But I really didn’t mind, because I was enjoying just being at home with my three kids. It was during this time that I began to hear about Jesus, and our need for him in our lives. We had already made it through some tough times, and were doing fine on our own. I had all that mattered, why should we need this God that people kept telling me about? But God was working in my heart and drawing me to him. I finally came to the realization that HE IS GOD! He’s not some gray haired old character in a fairy tale called ‘Genesis,’ or a mean father playing favorites as he was portrayed in a high school novel. God is real and he created me! When I looked at everything around me, I knew that God had created it all. It was so simple, why hadn’t I seen it before? If it wasn’t for God, I wouldn’t exist. Whether I am healthy, sick, rich, poor, happy or sad, the point is - I am. I realized how selfish I had been. For almost twenty seven years I’d thought about what I wanted and what I needed, without ever giving any thought to why I was here in the first place. I decided it was time to find out! I know now that the moment I finally acknowledged that God ‘is,’ and began to seek him, he honored his word by revealing more to me. As much as I was content with our life, and was enjoying our time together, there was always that nagging feeling that something was missing. That tugging on my heart didn’t go away until I stopped running, and allowed myself to listen to that still, small voice speaking ever so softly. On March 18, 1985, the fog and the mist finally cleared and that wall came down, when I asked Jesus to be my Saviour. Although it was a sunny, warm morning, spring had not yet arrived. The trees were still bare, and the yard was a mix of slush, mud and puddles. I was sitting on a stool in my porch, reading my Bible, as my children played in the front yard. I knew what I had to do, and that now was the time to do it. I quickly went into the house, and grabbed the salvation tract that I had been given the night before. I went back out to the porch, and read the tract one more time, this time praying the prayer at the end. I cried all the way through, as I received Jesus Christ as my Saviour. I looked up and once again watched the kids playing outside, too busy to notice their mom sitting there crying. But I immediately noticed some things. The first was a feeling of such utter relief…...the burden had been lifted! Then I looked out at the yard around me. Suddenly everything was beautiful! Somehow, I didn’t see the mud and the slush, or the gray, barren trees. All I saw was the sparkling sun on God’s wonderful creation, and the promise of new life! Finally my life had direction and true contentment. I realized that Jesus is the answer to all of life’s questions, and all I need to do is stop and pray, and he’ll show me the way. content with my portion, making my own way. Wasn’t seeking answers, nor looking beyond today. I thought I had what matters, why should I stop to pray? bidding me to listen….a voice I seemed to know. The tugging on my heart, I couldn’t brush away. Softly, he’d been calling all along the way. I gave my heart, my all, to Jesus Christ in prayer. content with my portion, following his way. Now I have the answer; my hope is beyond today. 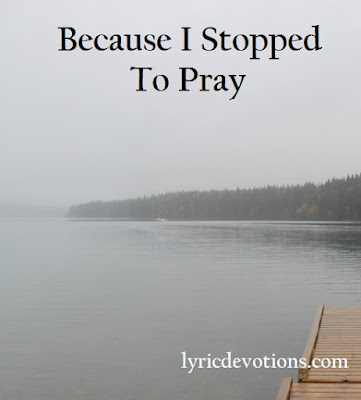 I know I have what matters, because I stopped to pray. I have what matters because I stopped to pray. Psalm 46:10 Be still and know that I am God: I will be exalted among the heathen, I will be exalted in the earth. 1 Kings 19:12 And after the earthquake a fire; but the Lord was not in the fire: and after the fire a still small voice. Oh wow! This was beautiful! Thank you for sharing it and telling your story so I could read it today. I am thankful the Lord saved you. It's strange how he meets us at the right time in our lives. PS I forgot to say I LOVE the words to your song!! Thank you, Terri. I'm thankful the Lord saved me too, and yes, God's timing is amazing! He makes all things beautiful in HIS time!